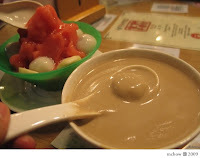 chinese sweet soups are the weird dessert/snacks that most westerners don't understand – think of it as chocolate pudding, except minus the chocolate and milk; then replace them with ground nuts or sesame seeds and finely ground rice and then cooked to thicken it, and then delicately sweetened. 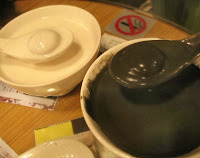 and then the big surprise in bowl are the tiny delicate glutinous rice dumpling-type balls filled with ground peanuts and sugar, called tong yuen (soup balls). sometimes eaten therapeutically, these sweet soups are more or less a winter treat... read more and you'll see what i mean. make a sugar syrup: heat sugar in water until completely dissolved, stirring occasionally to ensure sugar completely dissolves. avoid boiling the mixture. remove from heat and soak the rice in the sugar syrup (a few hours to overnight). lightly toast the almonds at a low heat in a wok until fragrant (between 5 and 10 minutes). do not burn them nor yourself. let them cool down enough to handle. filter the mix in a metal coffee filter to remove bits that didn't get ground. cook mixture it over medium heat until thickened, stirring constantly (avoid boiling). serve warm. hopefully there aren't any leftovers that you need to refrigerate. *almonds can be substituted for walnuts, white sesame, black sesame, cashews. you can also use chinese almonds (which are actually apricot kernels) and mix them with regular almonds.